Scene from the Official Inauguration of Halong Bay as one of the New7Wonders of Nature in My Dinh National Stadium, Hanoi. In a three-hour ceremony, punctuated by spectacular firework displays, Halong Bay was officially inaugurated as one of the New7Wonders of Nature in Hanoi last night. Addressing the public in My Dinh National Stadium, Bernard Weber, Founder-President of New7Wonders said, “The success of the New7Wonders of Nature campaign was due to the active participation of the people all around the world.” He added that the goal of New7Wonders was inspire and motivate the active participation of people in concepts that everyone could understand, and ideas that have real and lasting value. 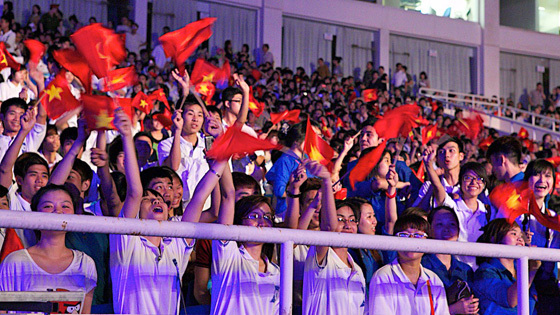 Deputy Prime Minister Nguyen Thien Nhan thanked the Vietnamese at home and abroad, who had voted for Halong Bay during the four-year campaign. “I also hope that local authorities and government agencies will increase their efforts to preserve the natural values of the bay in the near future,” he said. The highlight of the evening was the presentation of a specially-cast commemorative plaque recognizing Halong Bay as one of the New7Wonders of Nature. In the presence of Hoang Tuan Anhb, Minister of Culture, Sport and Tourism, and Nguyen Van Doc, chairman of Quang Ninh Province’s People’s Committee, Bernard Weber removed the veil with a flourish. 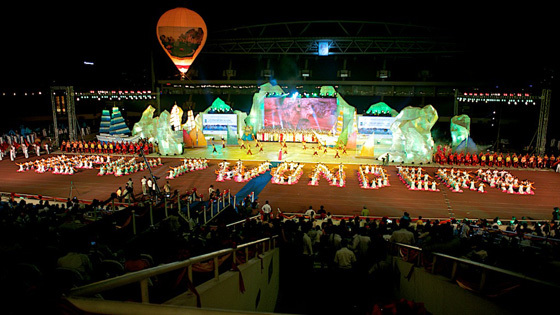 The unveiling was followed by a performance in which the stadium was transformed into a miniature version of Halong Bay with water, mountains and boats. With the theme of the dragons of Vietnam, which came down to earth and were turned into stone in the bay, singers, dancers and musicians portrayed the history and culture of the region and sites such as the citadel of the Ho Dynasty, the My Son Sanctuary and Hoi An City. 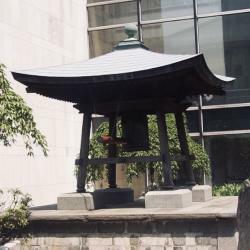 The show also featured aspects of Vietnam’s ancient heritage, including Nha nhac (court music of Hue), the gongs of the Central Highlands and the songs of Phu Tho Xoan. Spectators in My Dinh National Stadium, Hanoi, cheer the unveiling of the plaque recognizing Halong Bay as one of the New7Wonders of Nature.